← Report: "Waters" still used as annoying plural of "water"
Gottlieb, primary author of the movie’s screenplay as well as the film’s newspaper editor, Meadows (“I put it in the back with the grocery ads”), has been able to update his newsy first-hand account of the events leading up to and through shooting Jaws every decade, as the movie’s popularity continues to grow and its place in cinematic history is solidified. “The Jaws Log” provides sketches of the journey of Peter Benchley’s book from outline to publishing, detailing how little he got paid for the brunt of the work and the fortune he made as the book climbed the bestseller list and was optioned by Universal. 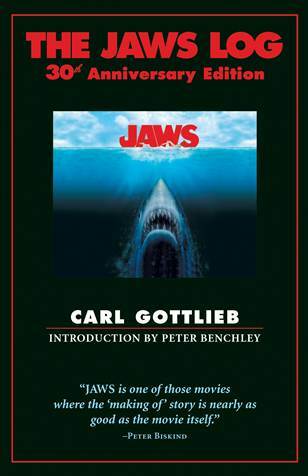 Then Gottlieb describes the acquisition process, the selection of a young and promising Steven Spielberg as the film’s director, and the grueling five-month shoot on Martha’s Vineyard, including the shots Benchley and Spielberg took at each other as the movie began a life of its own apart from the pulp literary smash of 1974. Gottlieb watches as residents of Martha’s Vineyard become savvier and savvier, squeezing the harried film crew for everything from rental boats to “zoning crap.” He also validates my feeling that the guys who do the scene with the “holiday roast” were bad actors. Film critic Nigel Andrews’ “jaws” is a brainy outsider’s view, though it does provide insight about each of the main characters, including a deeper understanding of Robert Shaw. Andrews’ book also delves into Spielberg’s filmic choices, including the Hitchcockian push/pull on Brody’s face on the beach, the symbolism of fences and the color yellow in the movie, and what Bruce the shark shares with killer trucks and the Creature from the Black Lagoon. Andrews is also in the camp that Brody is looking at his appendix scar. Both books are not only indispensable for Jaws fans and the people who love them, but also cheap. This entry was posted in Movie, Zeitgeist and tagged books, carl gottlieb, nigel andrews, scholarship. Bookmark the permalink.